Stepping onto the streets of Vietnam is like entering a big, bustling kitchen - everywhere, something is being rolled, boiled, steamed, or fried; pots of hot, fragrant pho sit over coal burners and balls of peanut-studded sticky rice are steamed and wrapped in newspaper. The food is fast, fresh, fragrant, and second to none in terms of its diversity and availability. 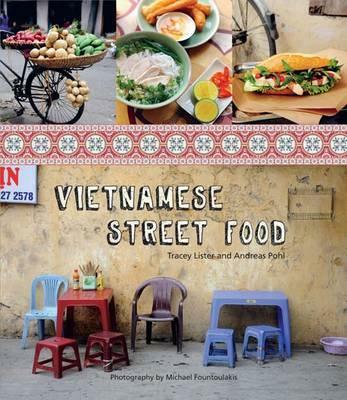 Vietnamese Street Food represents everything enticing there is to eat on the streets of Vietnam. It contains more than sixty well-loved and authentic recipes from Prawn and Rice Paper Rolls to Crab Wontons, from Classic Noodle Soup with Chicken to Salt and Pepper Squid, and Crunchy Baguettes Filled with Skewers of Lemongrass Beef. Alongside these recipes are the stories of people who run some of the most legendary street stalls, providing a glimpse into their lives and daily routines. The variety of dishes and cooking methods, be it rolled, boiled, steamed, or fried, combined with gorgeous photographs of every dishful will have you creating unpretentious, fresh, and flavorsome food for any occasion.